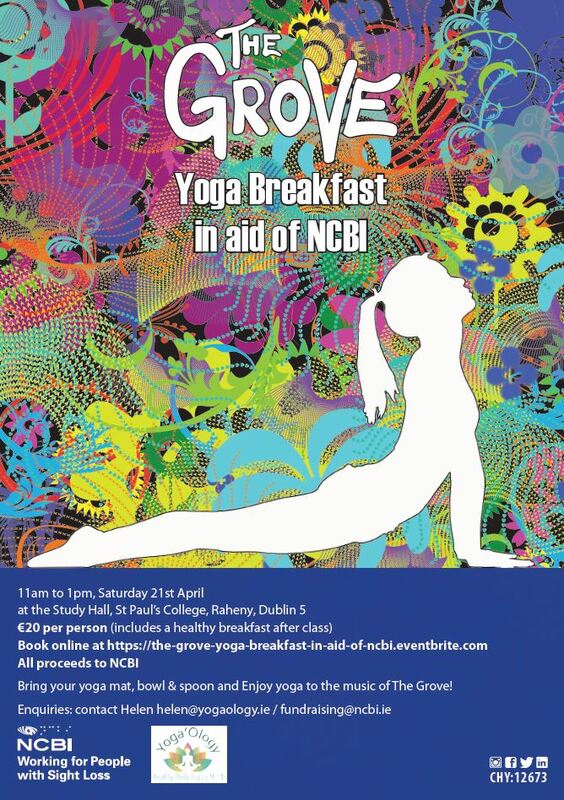 On Saturday 21st April, from 11am to 1pm, join us for a healthy breakfast and yoga session to the sounds of The Grove Social Club Disco at the Study Hall, St Paul’s College, Raheny, Dublin 5. Helen Mooney, of Yoga’ology, teaches yoga on a Friday morning at the NCBI Training Centre and is hosting this fundraising event. Where: Study Hall, St. Paul’s College, Raheny , Dublin 5. Please bring your yoga mat, bowl and spoon – a healthy breakfast will be provided! Kindly donated by Fyffes, Glenisk, Supervalu and Green Beards Juicery.